Google's just rolling out the Android apps left and right lately. Today, the G-gang announced the arrival of Google Earth for Android, a program revealed during the Nexus One's launch but not seen until now. 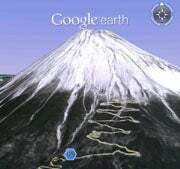 Google Earth for Android brings the full functionality of Google Earth onto your Android device. It allows you to navigate through three-dimensional images of the world, zooming into roads or flying Superman-style over mountains and lakes. The Google Earth app, interestingly, has been available on the iPhone for some time (it's apparently one of the few Google creations Apple hasn't yet banned). The Android version of the app, while slightly delayed in its arrival, does add some bells and whistles available only for Android fans. 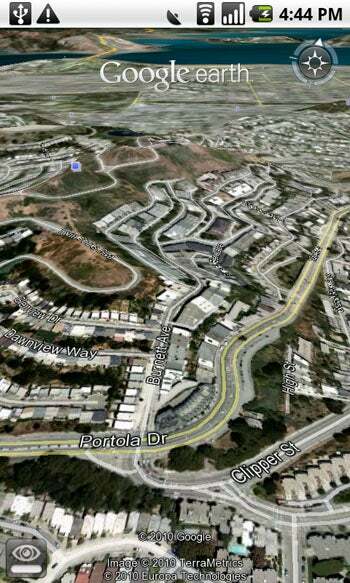 One of these is a newly created Roads layer for Google Earth mobile. As its name suggests, the Roads layer allows you to snap road labels on and off of any satellite image, bringing Google Maps-like functionality right into the Google Earth app. Google Earth for Android also features a new search-by-voice option. You can say either a destination name -- "Eiffel Tower," for example -- or just a general search term such as "hotels near Lake Tahoe." The Google Earth app will translate your words into text and zoom into the appropriate geographic area to display the results. Many Android users have noticed that Google Earth for Android isn't showing up within the App Market on their phones. There's a reason: It's available only for phones running Android 2.1, which limits it to the Nexus One at the moment. Contrary to some social media speculation, though, the new Google Earth app isn't a Nexus One exclusive. As other Android phones receive the 2.1 upgrade, they too will gain access to the application (officially, Google says "most devices" will be able to run Google Earth once they're running Android 2.1). Next up will likely be the Motorola Droid, which is slated to make the jump to 2.1 anytime now. The Motorola Cliq, HTC Hero, and Samsung Moment are all expected to be updated to Android 2.1 sometime in the second quarter of the year.